In the early 1800s, a young Mississippi River flat-boat operator submitted a patent application describing a device for "buoying vessels over shoals." The invention proposed to prevent a problem he had often witnessed on the river—boats grounded on sandbars—by equipping the boats with adjustable buoyant air chambers. The young man even whittled a model of his invention, but he was not destined for fame as an inventor; instead, Abraham Lincoln (1809-1865) was famous for much else. In fact Lincoln had a sound idea with his proposal to use buoyant force in protecting boats from running aground. Buoyancy on the surface of water has a number of easily noticeable effects in the real world. (Having established the definition of fluid, from this point onward, the fluids discussed will be primarily those most commonly experienced: water and air.) It is due to buoyancy that fish, human swimmers, icebergs, and ships stay afloat. Fish offer an interesting application of volume change as a means of altering buoyancy: a fish has an internal swim bladder, which is filled with gas. 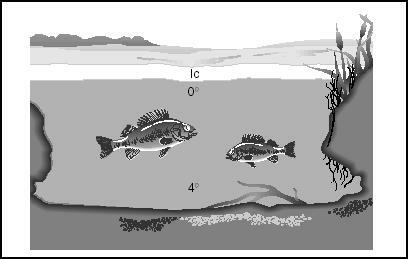 When it needs to rise or descend, it changes the volume in its swim bladder, which then changes its density. The examples of swimmers and icebergs directly illustrate the principle of density—on the part of the water in the first instance, and on the part of the object itself in the second. To a swimmer, the difference between swimming in fresh water and salt water shows that buoyant force depends as much on the density of the fluid as on the volume displaced. Fresh water has a density of 62.4 lb/ft 3 (9,925 N/m 3 ), whereas that of salt water is 64 lb/ft 3 (10,167 N/m 3 ). For this reason, salt water provides more buoyant force than fresh water; in Israel's Dead Sea, the saltiest body of water on Earth, bathers experience an enormous amount of buoyant force. Water is an unusual substance in a number of regards, not least its behavior as it freezes. Close to the freezing point, water thickens up, but once it turns to ice, it becomes less dense. This is why ice cubes and icebergs float. However, their low density in comparison to the water around them means that only part of an iceberg stays atop the surface. The submerged percentage of an iceberg is the same as the ratio of the density of ice to that of water: 89%. Because water itself is relatively dense, a high-volume, low-density object is likely to displace a quantity of water more dense—and heavier—than the object itself. By contrast, a steel ball dropped into the water will sink straight to the bottom, because it is a low-volume, high-density object that outweighs the water it displaced. This brings back the earlier question: how can a ship made out of steel, with a density of 487 lb/ft 3 (77,363 N/m 3 ), float on a salt-water ocean with an average density of only about one-eighth that amount? The answer lies in the design of the ship's hull. If the ship were flat like a raft, or if all the steel in it were compressed into a ball, it would indeed sink. Instead, however, the hollow hull displaces a volume of water heavier than the ship's own weight: once again, volume has been maximized, and density minimized. For a ship to be seaworthy, it must maintain a delicate balance between buoyancy and stability. A vessel that is too light—that is, too much volume and too little density—will bob on the top of the water. Therefore, it needs to carry a certain amount of cargo, and if not cargo, then water or some other form of ballast. Ballast is a heavy substance that increases the weight of an object experiencing buoyancy, and thereby improves its stability. Ideally, the ship's center of gravity should be vertically aligned with its center of buoyancy. The center of gravity is the geometric center of the ship's weight—the point at which weight above is equal to weight below, weight fore is equal to weight aft, and starboard (right-side) weight is equal to weight on the port (left) side. The center of buoyancy is the geometric center of its submerged volume, and in a stable ship, it is some distance directly below center of gravity. Displacement, or the weight of the fluid that is moved out of position when an object is immersed, gives some idea of a ship's stability. If a ship set down in the ocean causes 1,000 tons (8.896 · 10 6 N) of water to be displaced, it is said to possess a displacement of 1,000 tons. Obviously, a high degree of displacement is desirable. The principle of displacement helps to explain how an aircraft carrier can remain afloat, even though it weighs many thousands of tons. A submarine uses ballast as a means of descending and ascending underwater: when the submarine captain orders the crew to take the craft down, the craft is allowed to take water into its ballast tanks. If, on the other hand, the command is given to rise toward the surface, a valve will be opened to release compressed air into the tanks. The air pushes out the water, and causes the craft to ascend. T HE MOLECULAR STRUCTURE OF WATER BEGINS TO EXPAND ONCE IT COOLS BEYOND 39.4°F (4°C) AND CONTINUES TO EXPAND UNTIL IT BECOMES ICE . F OR THIS REASON , ICE IS LESS DENSE THAN WATER , FLOATS ON THE SURFACE , AND RETARDS FURTHER COOLING OF DEEPER WATER , WHICH ACCOUNTS FOR THE SURVIVAL OF FRESHWATER PLANT AND ANIMAL LIFE THROUGH THE WINTER . F OR THEIR PART , FISH CHANGE THE VOLUME OF THEIR INTERNAL SWIM BLADDER IN ORDER TO ALTER THEIR BUOYANCY . Though his diving bell made it possible for Halley to set up a company in which hired divers salvaged wrecks, it did not permit divers to go beyond relatively shallow depths. First of all, the diving bell received air from the surface: in Halley's time, no technology existed for taking an oxygen supply below. Nor did it provide substantial protection from the effects of increased pressure at great depths. The most immediate of those effects is, of course, the tendency of an object experiencing such pressure to simply implode like a tin can in a vise. Furthermore, the human body experiences several severe reactions to great depth: under water, nitrogen gas accumulates in a diver's bodily tissues, producing two different—but equally frightening—effects. Nitrogen is an inert gas under normal conditions, yet in the high pressure of the ocean depths it turns into a powerful narcotic, causing nitrogen narcosis—often known by the poetic-sounding name "rapture of the deep." Under the influence of this deadly euphoria, divers begin to think themselves invincible, and their altered judgment can put them into potentially fatal situations. Nitrogen narcosis can occur at depths as shallow as 60 ft (18.29 m), and it can be overcome simply by returning to the surface. However, one should not return to the surface too quickly, particularly after having gone down to a significant depth for a substantial period of time. In such an instance, on returning to the surface nitrogen gas will bubble within the body, producing decompression sickness—known colloquially as "the bends." This condition may manifest as itching and other skin problems, joint pain, choking, blindness, seizures, unconsciousness, and even permanent neurological defects such as paraplegia. French physiologist Paul Bert (1833-1886) first identified the bends in 1878, and in 1907, John Scott Haldane (1860-1936) developed a method for counteracting decompression sickness. He calculated a set of decompression tables that advised limits for the amount of time at given depths. He recommended what he called stage decompression, which means that the ascending diver stops every few feet during ascension and waits for a few minutes at each level, allowing the body tissues time to adjust to the new pressure. Modern divers use a decompression chamber, a sealed container that simulates the stages of decompression. In 1930, the American naturalist William Beebe (1877-1962) and American engineer Otis Barton created the bathy-sphere. This was the first submersible that provided the divers inside with adequate protection from external pressure. Made of steel and spherical in shape, the bathysphere had thick quartz windows and was capable of maintaining ordinary atmosphere pressure even when lowered by a cable to relatively great depths. In 1934, a bathysphere descended to what was then an extremely impressive depth: 3,028 ft (923 m). However, the bathysphere was difficult to operate and maneuver, and in time it was be replaced by a more workable vessel, the bathyscaphe. 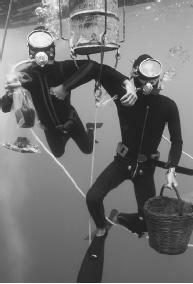 Before the bathyscaphe appeared, however, in 1943, two Frenchmen created a means for divers to descend without the need for any sort of external chamber. Certainly a diver with this new apparatus could not go to anywhere near the same depths as those approached by the bathy-sphere; nonetheless, the new aqualung made it possible to spend an extended time under the surface without need for air. It was now theoretically feasible for a diver to go below without any need for help or supplies from above, because he carried his entire oxygen supply on his back. The name of one of inventors, Emile Gagnan, is hardly a household word; but that of the other—Jacques Cousteau (1910-1997)—certainly is. So, too, is the name of their invention: the s elf- c ontained u nderwater b reathing a pparatus, better known as scuba. The most important feature of the scuba gear was the demand regulator, which made it possible for the divers to breathe air at the same pressure as their underwater surroundings. This in turn facilitated breathing in a more normal, comfortable manner. Another important feature of a modern diver's equipment is a buoyancy compensation device. Like a ship atop the water, a diver wants to have only so much buoyancy—not so much that it causes him to surface. As for the bathyscaphe—a term whose two Greek roots mean "deep" and "boat"—it made its debut five years after scuba gear. Built by the Swiss physicist and adventurer Auguste Piccard (1884-1962), the bathyscaphe consisted of two compartments: a heavy steel crew cabin that was resistant to sea pressure, and above it, a larger, light container called a float. The float was filled with gasoline, which in this case was not used as fuel, but to provide extra buoyancy, because of the gasoline's low specific gravity. When descending, the occupants of the bathyscaphe—there could only be two, since the pressurized chamber was just 79 in (2.01 m) in diameter—released part of the gasoline to decrease buoyancy. They also carried iron ballast pellets on board, and these they released when preparing to ascend. Thanks to battery-driven screw propellers, the bathyscaphe was much more maneuverable than the bathysphere had ever been; furthermore, it was designed to reach depths that Beebe and Barton could hardly have conceived. It took several years of unsuccessful dives, but in 1953 a bathyscaphe set the first of many depth records. This first craft was the Trieste, manned by Piccard and his son Jacques, which descended 10,335 ft (3,150 m) below the Mediterranean, off Capri, Italy. A year later, in the Atlantic Ocean off Dakar, French West Africa (now Senegal), French divers Georges Houot and Pierre-Henri Willm reached 13,287 ft (4,063 m) in the FNRS 3. Then in 1960, Jacques Piccard and United States Navy Lieutenant Don Walsh set a record that still stands: 35,797 ft (10,911 m)—23% greater than the height of Mt. Everest, the world's tallest peak. This they did in the Trieste some 250 mi (402 km) southeast of Guam at the Mariana Trench, the deepest spot in the Pacific Ocean and indeed the deepest spot on Earth. Piccard and Walsh went all the way to the bottom, a descent that took them 4 hours, 48 minutes. Coming up took 3 hours, 17 minutes. Thirty-five years later, in 1995, the Japanese craft Kaiko also made the Mariana descent and confirmed the measurements of Piccard and Walsh. But the achievement of the Kaiko was not nearly as impressive of that of the Trieste's twoman crew: the Kaiko, in fact, had no crew. By the 1990s, sophisticated remote-sensing technology had made it possible to send down unmanned ocean expeditions, and it became less necessary to expose human beings to the incredible risks encountered by the Piccards, Walsh, and others. An example of such an unmanned vessel is the one featured in the opening minutes of the Academy Award-winning motion picture Titanic (1997). The vessel itself, whose sinking in 1912 claimed more than 1,000 lives, rests at such a great depth in the North Atlantic that it is impractical either to raise it, or to send manned expeditions to explore the interior of the wreck. The best solution, then, is a remotely operated vessel of the kind also used for purposes such as mapping the ocean floor, exploring for petroleum and other deposits, and gathering underwater plate technology data. The craft used in the film, which has "arms" for grasping objects, is of a variety specially designed for recovering items from shipwrecks. For the scenes that showed what was supposed to be the Titanic as an active vessel, director James Cameron used a 90% scale model that depicted the ship's starboard side—the side hit by the iceberg. Therefore, when showing its port side, as when it was leaving the Southampton, England, dock on April 15, 1912, all shots had to be reversed: the actual signs on the dock were in reverse lettering in order to appear correct when seen in the final version. But for scenes of the wrecked vessel lying at the bottom of the ocean, Cameron used the real Titanic. To do this, he had to use a submersible; but he did not want to shoot only from inside the submersible, as had been done in the 1992 IMAX film Titanica. Therefore, his brother Mike Cameron, in cooperation with Panavision, built a special camera that could with stand 400 atm (3.923 · 10 7 Pa)—that is, 400 times the air pressure at sea level. The camera was attached to the outside of the submersible, which for these external shots was manned by Russian submarine operators. would have been too dangerous for the humans in the manned craft. Cameron had intended the remotely operated submersible as a mere prop, but in the end its view inside the ruined Titanic added one of the most poignant touches in the entire film. To these he later added scenes involving objects specific to the film's plot, such as the safe. These he shot in a controlled underwater environment designed to look like the interior of the Titanic. In the earlier description of Piccard's bathyscaphe design, it was noted that the craft consisted of two compartments: a heavy steel crew cabin resistant to sea pressure, and above it a larger, light container called a float. If this sounds rather like the structure of a hot-air balloon, there is no accident in that. In 1931, nearly two decades before the bathyscaphe made its debut, Piccard and another Swiss scientist, Paul Kipfer, set a record of a different kind with a balloon. Instead of going lower than anyone ever had, as Piccard and his son Jacques did in 1953—and as Jacques and Walsh did in an even greater way in 1960—Piccard and Kipfer went higher than ever, ascending to 55,563 ft (16,940 m). This made them the first two men to penetrate the stratosphere, which is the next atmospheric layer above the troposphere, a layer approximately 10 mi (16.1 km) high that covers the surface of Earth. Piccard, without a doubt, experienced the greatest terrestrial altitude range of any human being over a lifetime: almost 12.5 mi (20.1 km) from his highest high to his lowest low, 84% of it above sea level and the rest below. His career, then, was a tribute to the power of buoyant force—and to the power of overcoming buoyant force for the purpose of descending to the ocean depths. Indeed, the same can be said of the Piccard family as a whole: not only did Jacques set the world's depth record, but years later, Jacques's son Bertrand took to the skies for another record-setting balloon flight. In 1999, Bertrand Piccard and British balloon instructor Brian Wilson became the first men to circumnavigate the globe in a balloon, the Breitling Orbiter 3. The craft extended 180 ft (54.86) from the top of the envelope—the part of the balloon holding buoyant gases—to the bottom of the gondola, the part holding riders. The pressurized cabin had one bunk in which one pilot could sleep while the other flew, and up front was a computerized control panel which allowed the pilot to operate the burners, switch propane tanks, and release empty ones. It took Piccard and Wilson just 20 days to circle the Earth—a far cry from the first days of ballooning two centuries earlier. The Piccard family, though Swiss, are francophone; that is, they come from the French-speaking part of Switzerland. This is interesting, because the history of human encounters with buoyancy—below the ocean and even more so in the air—has been heavily dominated by French names. In fact, it was the French brothers, Joseph-Michel (1740-1810) and Jacques-Etienne (1745-1799) Montgolfier, who launched the first balloon in 1783. These two became to balloon flight what two other brothers, the Americans Orville and Wilbur Wright, became with regard to the invention that superseded the balloon twelve decades later: the airplane. On that first flight, the Montgolfiers sent up a model 30 ft (9.15 m) in diameter, made of linen-lined paper. It reached a height of 6,000 ft (1,828 m), and stayed in the air for 10 minutes before coming back down. Later that year, the Montgolfiers sent up the first balloon flight with living creatures—a sheep, a rooster, and a duck—and still later in 1783, Jean-François Pilatre de Rozier (1756-1785) became the first human being to ascend in a balloon. Rozier only went up 84 ft (26 m), which was the length of the rope that tethered him to the ground. As the makers and users of balloons learned how to use ballast properly, however, flight times were extended, and balloon flight became ever more practical. In fact, the world's first military use of flight dates not to the twentieth century but to the eighteenth—1794, specifically, when France created a balloon corps. There are only three gases practical for lifting a balloon: hydrogen, helium, and hot air. Each is much less than dense than ordinary air, and this gives them their buoyancy. In fact, hydrogen is the lightest gas known, and because it is cheap to produce, it would be ideal—except for the fact that it is extremely flammable. After the 1937 crash of the airship Hindenburg, the era of hydrogen use for lighter-than-air transport effectively ended. Helium, on the other hand, is perfectly safe and only slightly less buoyant than hydrogen. This makes it ideal for balloons of the sort that children enjoy at parties; but helium is expensive, and therefore impractical for large balloons. Hence, hot air—specifically, air heated to a temperature of about 570°F (299°C), is the only truly viable option. Charles's law, one of the laws regarding the behavior of gases, states that heating a gas will increase its volume. Gas molecules, unlike their liquid or solid counterparts, are highly nonattractive—that is, they tend to spread toward relatively great distances from one another. There is already a great deal of empty space between gas molecules, and the increase in volume only increases the amount of empty space. Hence, density is lowered, and the balloon floats. O NCE CONSIDERED OBSOLETE , BLIMPS ARE ENJOYING A RENAISSANCE AMONG SCIENTISTS AND GOVERNMENT AGENCIES . T HE BLIMP PICTURED HERE , THE A EROSTAT BLIMP , IS EQUIPPED WITH RADAR FOR DRUG ENFORCEMENT AND INSTRUMENTS FOR WEATHER OBSERVATION . more streamlined, maneuverable model. Early balloons, after all, could only be maneuvered along one axis, up and down: when it came to moving sideways or forward and backward, they were largely at the mercy of the elements. It was more than a century before Meusnier's idea—the prototype for an airship—became a reality. In 1898, Alberto Santos-Dumont of Brazil combined a balloon with a propeller powered by an internal-combustion instrument, creating a machine that improved on the balloon, much as the bathyscaphe later improved on the bathysphere. Santos-Dumont's airship was non-rigid, like a balloon. It also used hydrogen, which is apt to contract during descent and collapse the envelope. To counter this problem, Santos-Dumont created the ballonet, an internal airbag designed to provide buoyancy and stabilize flight. One of the greatest figures in the history of lighter-than-air flight—a man whose name, along with blimp and dirigible, became a synonym for the airship—was Count Ferdinand von Zeppelin (1838-1917). It was he who created a lightweight structure of aluminum girders and rings that made it possible for an airship to remain rigid under varying atmospheric conditions. Yet Zeppelin's earliest launches, in the decade that followed 1898, were fraught with a number of problems—not least of which were disasters caused by the flammability of hydrogen. Zeppelin was finally successful in launching airships for public transport in 1911, and the quarter-century that followed marked the golden age of airship travel. Not that all was "golden" about this age: in World War I, Germany used airships as bombers, launching the first London blitz in May 1915. By the time Nazi Germany initiated the more famous World War II London blitz 25 years later, ground-based anti-aircraft technology would have made quick work of any zeppelin; but by then, airplanes had long since replaced airships. During the 1920s, though, airships such as the Graf Zeppelin competed with airplanes as a mode of civilian transport. It is a hallmark of the perceived safety of airships over airplanes at the time that in 1928, the Graf Zeppelin made its first transatlantic flight carrying a load of passengers. Just a year earlier, Charles Lindbergh had made the first-ever solo, nonstop transatlantic flight in an airplane. Today this would be the equivalent of someone flying to the Moon, or perhaps even Mars, and there was no question of carrying passengers. Furthermore, Lindbergh was celebrated as a hero for the rest of his life, whereas the passengers aboard the Graf Zeppelin earned no more distinction for bravery than would pleasure-seekers aboard a cruise. THE LIMITATIONS OF LIGHTER-THAN-AIR TRANSPORT. For a few years, airships constituted the luxury liners of the skies; but the Hindenburg crash signaled the end of relatively widespread airship transport. In any case, by the time of the 1937 Hindenburg crash, lighter-than-air transport was no longer the leading contender in the realm of flight technology. Ironically enough, by 1937 the airplane had long since proved itself more viable—even though it was actually heavier than air. The principles that make an airplane fly have little to do with buoyancy as such, and involve differences in pressure rather than differences in density. Yet the replacement of lighter-than-air craft on the cutting edge of flight did not mean that balloons and airships were relegated to the museum; instead, their purposes changed. The airship enjoyed a brief resurgence of interest during World War II, though purely as a surveillance craft for the United States military. In the period after the war, the U.S. Navy hired the Goodyear Tire and Rubber Company to produce airships, and as a result of this relationship Goodyear created the most visible airship since the Graf Zeppelin and the Hindenburg: the Goodyear Blimp. BLIMPS AND BALLOONS: ON THE CUTTING EDGE?. The blimp, known to viewers of countless sporting events, is much better-suited than a plane or helicopter to providing TV cameras with an aerial view of a stadium—and advertisers with a prominent billboard. Military forces and science communities have also found airships useful for unexpected purposes. 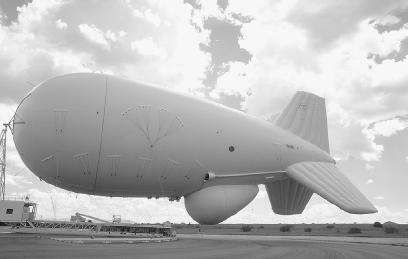 Their virtual invisibility with regard to radar has reinvigorated interest in blimps on the part of the U.S. Department of Defense, which has discussed plans to use airships as radar platforms in a larger Strategic Air Initiative. In addition, French scientists have used airships for studying rain forest treetops or canopies. Balloons have played a role in aiding space exploration, which is emblematic of the relationship between lighter-than-air transport and more advanced means of flight. In 1961, Malcolm D. Ross and Victor A. Prother of the U.S. Navy set the balloon altitude record with a height of 113,740 ft (34,668 m.) The technology that enabled their survival at more than 21 mi (33.8 km) in the air was later used in creating life-support systems for astronauts. Balloon astronomy provides some of the clearest images of the cosmos: telescopes mounted on huge, unmanned balloons at elevations as high as 120,000 ft (35,000 m)—far above the dust and smoke of Earth—offer high-resolution images. Balloons have even been used on other planets: for 46 hours in 1985, two balloons launched by the unmanned Soviet expedition to Venus collected data from the atmosphere of that planet. American scientists have also considered a combination of a large hot-air balloon and a smaller helium-filled balloon for gathering data on the surface and atmosphere of Mars during expeditions to that planet. As the air balloon is heated by the Sun's warmth during the day, it would ascend to collect information on the atmosphere. (In fact the "air" heated would be from the atmosphere of Mars, which is composed primarily of carbon dioxide.) Then at night when Mars cools, the air balloon would lose its buoyancy and descend, but the helium balloon would keep it upright while it collected data from the ground. "Buoyancy" (Web site). <http://www.aquaholic.com/gasses/laws.htm> (March 12, 2001). "Buoyancy" (Web site). <http://www.uncwil.edu/nurc/aquarius/lessons/buoyancy.htm> (March 12, 2001). "Buoyancy Basics" Nova/PBS (Web site). <http://www.pbs.org/wgbh/nova/lasalle/buoybasics.html> (March 12, 2001). Challoner, Jack. Floating and Sinking. Austin, TX: Raintree Steck-Vaughn, 1997. Cobb, Allan B. Super Science Projects About Oceans. New York: Rosen, 2000. Gibson, Gary. Making Things Float and Sink. Illustrated by Tony Kenyon. Brookfield, CT: Copper Beeck Brooks, 1995. Taylor, Barbara. Liquid and Buoyancy. New York: Warwick Press, 1990.
have been able to float in any position effortlessly and endlessly since I can remember, wether I was thin, chubby or now in my sixties and overweight! I can stand vertically at any depth in salt water, or pool water and my head will always be out of the water just floating. No movements whatsoever on my part, not even my fingers! I will float forever if that would be possible. I feel like I am a human raft or floating device I float like an empty bottle with a cork. Besides my body shape is as the bottle much bigger from my waste down. So yes there are humans like me that can endlessly and effortlessly float indefinitely! Thank you for your resources. I will use to make connections to real life applications on this topic in class. This is very helpful! I was looking for things people had made that involved Buoyancy for a class project and This came up first! I am so glad it did too! !